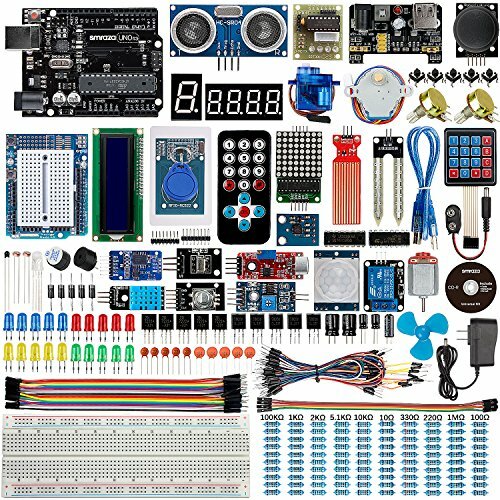 The Complete Uno Learning Starter Kit for Arduino UNO R3 - Include more than 200 individual components(64 parts) to learn Arduino Projects. Safe to Use - 9V 1A Power Adapter to make your project more flexible and safety, all of modules come soldered. Updated UNO R3 Kit for Arduino - Included UNO R3 controller board and sensors modules, all components are 100% compatible with arduino. Detailed Tutorials + Technical Support - Provide instructions (more than 35 Lessons with PDF tutorial) with programming code to use directly. Convenient Storage Box w/ dividers - All components are packaged in a bigger enough box and provide dividers for you to keep components neat.